Killing an infestation of fleas on your pet may not solve your flea problem if you allow your pet free access to the lawn and the lawn itself harbors the tiny pests. Each time your pet ventures onto the yard a new crop of fleas will infest your animal. The trick is to rid your lawn of fleas at the same time that you kill the little buggers on your pet. A simple spray made with Dawn dish soap is all that most homeowners need to rid their yard and pet of troublesome fleas. Mow your lawn to a height of 1-1/2 to 2 inches. This allows sunlight to heat the ground -- killing flea eggs -- and will allow sprays to reach the ground where fleas and their eggs live. Fill a lawn sprayer with water -- this is the same type of hand-held sprayer that you would use for applying insecticides or weed sprays. Add 1 oz. of Dawn dish soap. Spray your entire yard with the Dawn dish soap and water mixture in the late evening, allowing the detergent to do its job for several hours before the sun rises and dries the soapy water, reducing its effectiveness. Check your lawn for fleas the following morning. 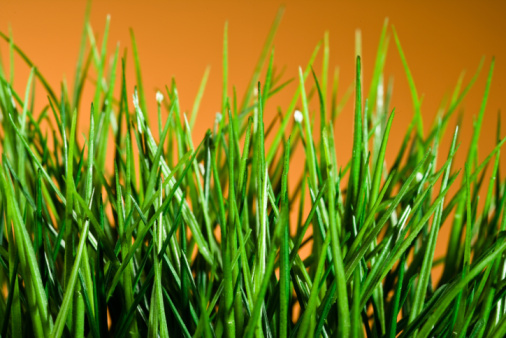 If no fleas are found, water your lawn thoroughly to keep the grass roots moist. If fleas are still present, repeat your spraying that evening. By the next morning all fleas should be gone from your yard and you can begin watering in order to prevent the grass roots from drying out. Repeat spraying your entire yard approximately 10 to 12 days after the first spraying. This will allow flea eggs that were present during your first spraying to hatch and allow you to kill the next batch of fleas. Inspect your yard every 10 to 12 days and repeat spraying with Dawn as necessary to maintain a flea-free yard.